I was actually doing my very best NOT to do a Sideshow review this week. I mean, c'mon - I've had at least one up every week for the last four weeks. But they just keep shipping out a ton of product right now for just about every license, and being the big sucker I am, I keep buying way too much. It doesn't help that it seems like nothing else is out right now. The latest release in their X-Files series is Frank Black. 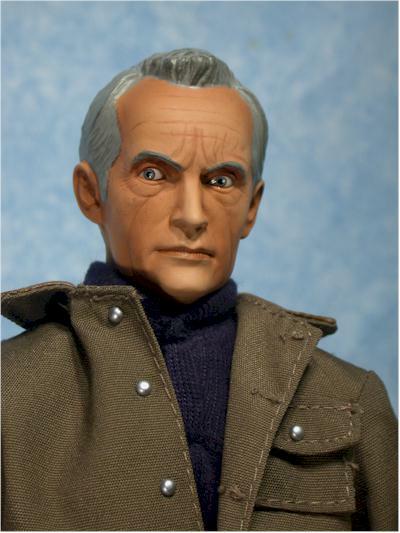 Most folks know Frank from his own series, Millennium, which was a short lived spin off from X-Files. This is the fourth figure in this license, following Mulder, Sculley (both reviewed here), and the Cigarette Smoking Man (reviewed here). Announced but not yet released yet is Autopsy Scully, "Home" Mulder, and John Doggett. Frank Black has just started shipping from Sideshow. As usual, there was both a regular and 'exclusive' version, and I'll be reviewing the exclusive version tonight. It includes one additional accessory - a Holy Bible. Frank sold from Sideshow for $45, but is long since sold out. However, I've included some suggestions for picking him up on-line at the end of the review. The usual great Sideshow work. I've praised them repeatedly for their excellent use of graphics and text, and here they go with photos of the actor, Lance Henriksen, rather than the figure itself. The box fits in nicely with the rest of the series, and is very collector friendly. It has a bunch of those new dental floss ties, so if you do put things back you'll need to use some clear tape to keep them in the tray, but that's a fairly small price to pay. 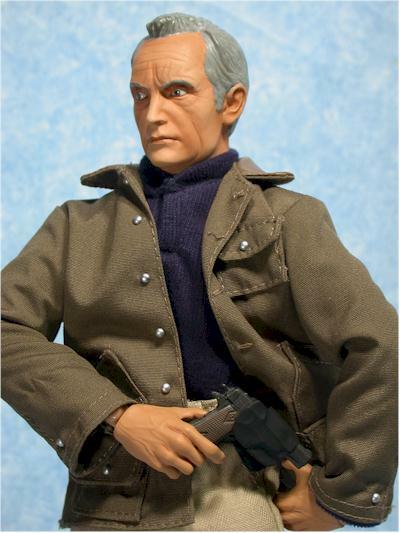 The single most important characteristic of any licensed action figure is the likeness. Getting that right doesn't mean you'll automatically hit it out of the park - there's still plenty of other important categories - but manage to screw that up, and it's going to be mighty tough to impress people no matter how well you do anything else. Unfortunately, that's the case here. I'm not quite sure what's happened though, and my best guess is that manufacturing quality problems have ruined what was once a pretty decent looking head sculpt. The prototypes weren't as perfect as, say, CSM, but they were still fairly good. You could certainly see Frank, in all his wrinkly, craggy, scratchy glory. The final product misses the mark as bad or worse than the recent Willow. For me, the chin and neck are the biggest issue, being much thinner and narrower than the forehead. Henriksen has a fairly evenly sized face, width-wise from top to bottom, but this version has a much wider head up top, coming to a very narrow, pointy chin. The hair sculpt is actually fairly good, although the paint ops don't allow that to show. There's rumors that the heads are being made from a softer material, with a more roto-cast type manufacturing process, but if that's the case I can't prove it. The head doesn't seem a lot lighter in weight, but the sculpt does seem to have that slightly odd appearance you so often get from cheaper manufacturing processes, more like a company producing a knock off of a Sideshow product, rather than the actual real deal. The hand sculpts are fine, and both hands work fairly well with most of the accessories. The paint ops don't do much to improve on what is already a weak looking head. Issues include the hair line, inconsistency in the facial tone, and an over use of wash on the face. You'll notice I didn't mention the most obvious oddity - his drifting right eye. I'd be very critical of it if every one of these figures I've seen didn't have it. That would mean it was sloppy work. But that's clearly not the case - they meant for it to look this way. Now I don't remember Lance every having a lazy eye, so it can't be that. The best I can figure is that he's supposed to be glancing off to his right, and often when you do that one eye tends to be further over than the other. At the right angle, that's what it looks like the intention was, and it does look right if you turn his head *just* right. Of course, lining the pupils up a little cleaner might have made for less trouble getting him to look good. I could live with the eyes though if they hadn't over done the wash on the face in an attempt to bring out the wrinkles, and done such a sloppy job on the hair line. Both add to that feel that this isn't real Sideshow product, but rather someone trying to be as good and failing. For me, there's nothing to complain about here. Not only does the Sideshow body have all the cool joints, they are all tight and he stands great on his own in many poses. 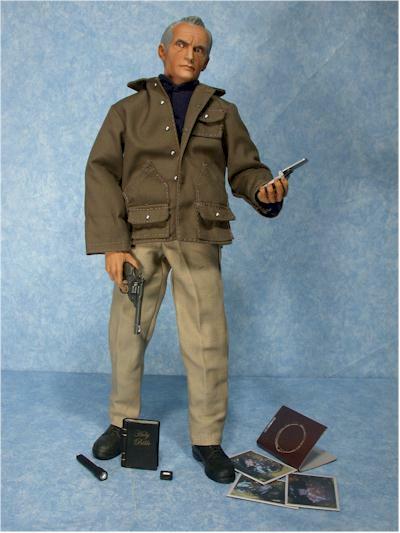 Frank comes with a nice variety of accessories, even without the exclusive bible. There's the usual display stand, with the X-Files logo. You won't need it, but it's still nice to have. Frank has his Holy Bible, but the book is solid and does not open. 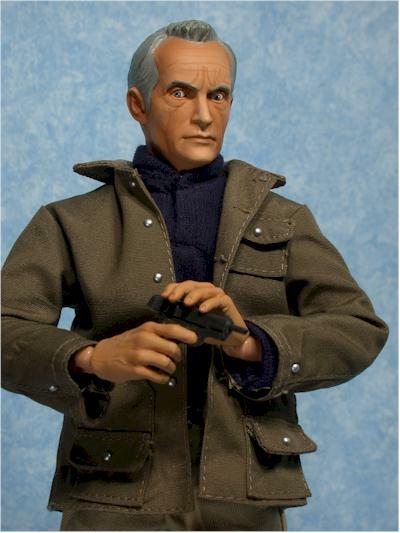 He also comes with a Webley revolver, a .45 with working slide and removable clip, a holster for his .45, an itsy-bitsy pager, flashlight, cel phone and Millennium case folder with several photos. Now, some of these accessories are reused from previous figures, but this is still a good assortment - and sensible one - for the average Sideshow figure. While his outfit is fairly basic, it's also very well tailored, and there appears to be less desire to cut costs. The shirt is a cool velour-like material, with full length sleeves. 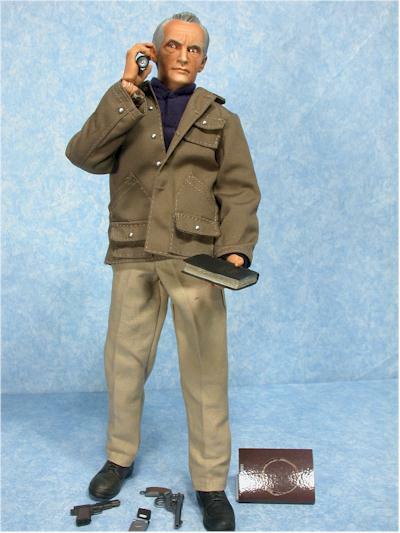 The jacket actually has a couple real pockets, and the pants fit much better than the usual sixth scale dungarees. The boot sculpt looks great, and the belt fits well. The belt is the only spot you'll want to be careful with, as it could be pretty easy to damage if you're not careful. The accessories and outfits are cool, but it's going to be the rare kid that finds Frank all that much fun. Hey, his friends don't find him all that much fun. At $40, he would have been a pretty average value, but at the extra $5, he's pushing it. That being said, it's worth nothing that people don't buy Sideshow products because they are a great value. They buy them for their quality. If Sideshow begins to try to cut or curtail costs at the expense of quality, they'll miss the target completely. Their market is much more willing to spend $45 or even $50 on a great looking figure, than $40 on one that looks like this. This figure almost hit the two star mark - almost. If he hadn't came pack with such a good assortment of accessories, and the outfit hadn't been above average, he would have been a two star figure for sure. The sculpt and paint ops on him are certainly disappointing for me, especially after the exceptional work on CSM. Sideshow's last few releases have not been up to the level of quality of so many previous ones, and I think it's an issue they need to get under control, or the backlash could be swifter and more painful than they expect. Try to hang on to the pager for more than 30 seconds, and be careful clipping things on to the belt - it's easy to break. - Fireside Collectibles has him for just $33. - Alter Ego Comics has him for $36.